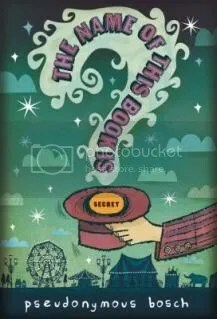 Posted on July 3, 2012	by Katy K.
The Name of This Book Is Secret by Pseudonymous Bosch. Read by David Pittu. This is first in a series of five books all named to discourage the reader from opening up the book. It’s a fun concept, and I’d been meaning to get around to them for a while. Pseudonymous Bosch is a very prominent narrator throughout the story, and he (or she!) spends a great deal of time at the beginning explaining that the setting of the book and the names of the characters are all meant to be non-specific, to protect the people involved, and most importantly, to protect us, the reader, from the horrors that might befall us if anyone found out that we know the secrets. Then we get on with the story, which is adventure, mystery and a little fantasy. Our heroes are Cass and Max-Ernest, both of whom have trouble fitting in at school. Cass lives with her overprotective mother and spends a lot of time with two older men she calls her grandfathers, who run an antique store in an old fire station. Max-Ernest lives with his parents, who are divorced but live in separate half of the same house, refusing to acknowledge each other’s existence. The adventure begins when a real estate agent brings a pile of boxes from an estate house in to the antique store. In one box, Cass finds a fascinating box called the Symphony of Smells, which contains hundreds of tiny bottles of different scents. She learns that a fire burned only the kitchen, and, it is presumed, the owner of the house, an old magician. Cass and Max-Ernest go to explore the house and find a secret room. They barely escape with the magician’s old journal just as a creepy-looking couple, including a woman whose beauty and stiffness are both unnatural. When the same couple – Dr. L and Ms. Mauvais – turns up at their school the next day and a boy with synesthesia from the school goes missing at the same time, Cass is highly suspicious. Unfortunately, she’s of such an openly suspicious nature that now, when it really matters, no one will believe her. She goes off, followed by Max-Ernest, to solve the mysteries: what happened to the old magician? Why have series of talented children with synesthesia gone missing over the years? Why does the spa known as the Midnight Sun keep itself so very secret? Doom is predicted at every turn, but with somewhat less depressing results than another popular series with a prominent narrator. As in The Calder Game, there are a number of puzzles for Cass and Max-Ernest to solve, which the interested reader can solve along with them. There’s just a hint of magic as Dr. L and Ms. Mauvais are (shh!) searching for the secret of immortality. There’s even some character development, which one doesn’t necessarily expect in an adventure/mystery type book. The boy and I listened to this, narrated by David Pittu. He quite enjoyed it; I liked it fine, if it didn’t particularly grab me. That may be me just being jaded about danger levels, finding the dangers in the book not nearly as dire as the narrator foretold. So maybe better for kids than adults, but still a lot of fun. This entry was posted in Books, Uncategorized and tagged adventure, Mystery, youth fantasy. Bookmark the permalink.